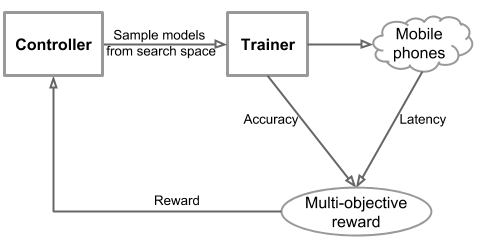 Unlike in previous architecture search approaches, where model speed is considered via another proxy (e.g., FLOPS), our approach directly measures model speed by executing the model on a particular platform, e.g., Pixel phones which were used in this research study. In this way, we can directly measure what is achievable in real-world practice, given that each type of mobile devices has its own software and hardware idiosyncrasies and may require different architectures for the best trade-offs between accuracy and speed. 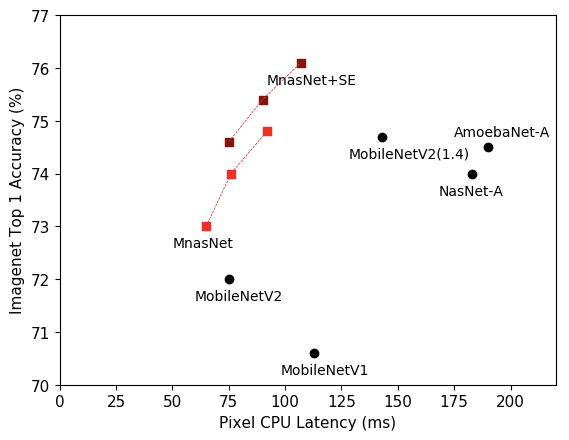 With the same accuracy, our MnasNet model runs 1.5x faster than the hand-crafted state-of-the-art MobileNetV2, and 2.4x faster than NASNet, which also used architecture search. After applying the squeeze-and-excitation optimization, our MnasNet+SE models achieve ResNet-50 level top-1 accuracy at 76.1%, with 19x fewer parameters and 10x fewer multiply-adds operations. On COCO object detection, our model family achieve both higher accuracy and higher speed over MobileNet, and achieves comparable accuracy to the SSD300 model with 35x less computation cost. We are pleased to see that our automated approach can achieve state-of-the-art performance on multiple complex mobile vision tasks. In future, we plan to incorporate more operations and optimizations into our search space, and apply it to more mobile vision tasks such as semantic segmentation.